It is your wedding day. This is great! So very Dwight. Hoping this is the groom’s cake. Was this done for a cooking class assignment? Beautiful! So succinct and unsentimental, so Dwight! That is my kind of wedding cake! An understated elegance that’s for sure. LOL, yes, this was a great cake… featured on Cake Wrecks, as Jes said, a few weeks ago, and yes, jim’stravelingpants—if I remember right, it was a groom’s cake (maybe for the bachelor party? I can’t remember now). And most of the comments on that post were along the lines of, “This isn’t a Wreck! This is Office brilliance in action!” :-) Very clever of you, Becca, to bring it up in conjunction with Jim and Pam’s wedding! Too Cute! I tried to convince my boyfriend’s brother to do this to his groom’s cake. On another note, I love the “wedding themed” Officetally! If Dwangela ever gets married this should be their cake. Except with grey frosting. Does the frosting match the carpet? aaah, classic dwight. gotta love it! Brillant. 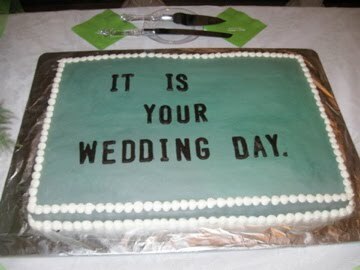 I would have this cake at my wedding if my husband-to-be was as big of an Office as me. He likes the Office but he is not a dork about it like me. Where’s the Chiclet for the pillow? !